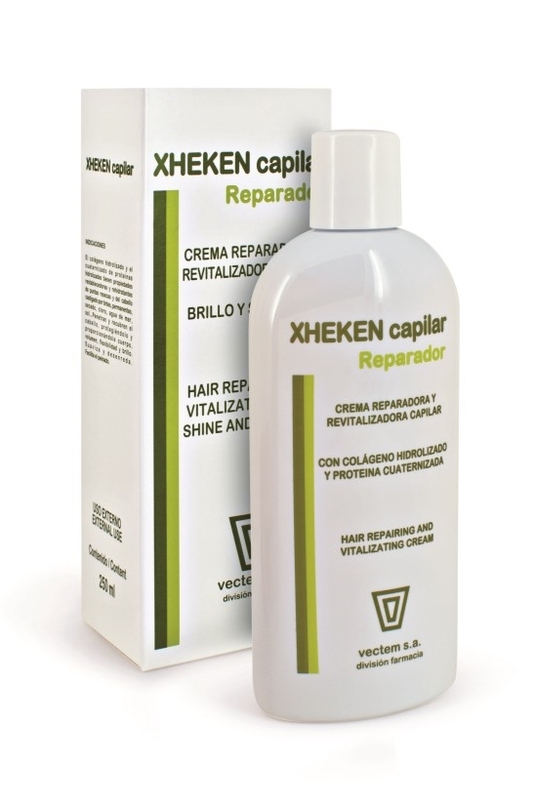 XHEKEN HAIR , vectem s.a. Hair repair product with quaternised hydrolysed collagen protein, which promotes hair protection and recovery. The hydrolysed collagen penetrates and coats the hair fibres. The quaternised protein enhances the hair's substantivity with its ionic powers, coating each strand with a strong hold protective film that ensures a lasting effect. Both ingredients enhance hair texture and shine while fixing and repairing stressed, damaged hair and split ends. Repairs and protects damaged or dehydrated hair by physical and chemical agents (dyes, perms, harsh shampoos, sun, salt water, chlorine, etc.). Can also be used as a hair moisturiser, conditioner or mask.